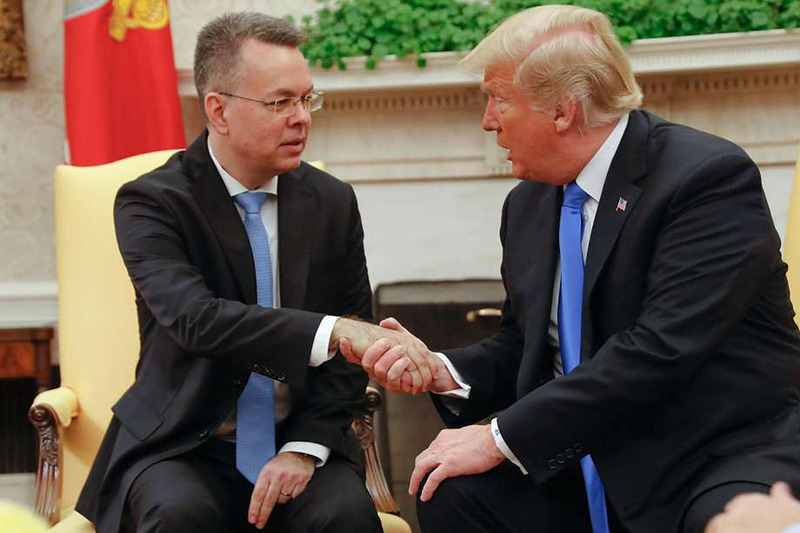 Trump welcomed Brunson to the White House on Saturday to celebrate Brunson’s release from nearly two years of confinement in Turkey, which had sparked a diplomatic row with a key ally and outcry from U.S. evangelical groups. Prominent evangelical leaders such as Tony Perkins have championed Brunson’s case, as has Vice President Mike Pence. First word of Brunson’s arrival back on American soil Saturday came from Perkins, president of the Family Research Council. Perkins tweeted just after noon that he had landed at a military base outside Washington with Brunson and his wife, Norine. Erdogan said on Twitter that he hoped the two countries will continue to cooperate “as it befits two allies.” Erdogan also called for joint efforts against terrorism, and he listed the Islamic State group, Kurdish militants and the network of a U.S.-based Muslim cleric whom Turkey blames for a failed coup in 2016.